The Ann Arbor Hands-On Museum is an ideal place for teens to learn more about the world around them while having fun. 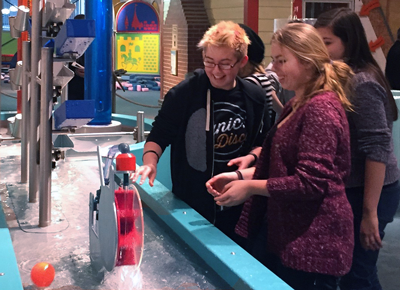 Middle and High School students can explore our exhibits in complex ways that engage their learning in school with even more concepts, while they play in the Museum. The Museum offers a variety of evening workshops throughout the year, designed specifically for families, adults, Middle School and/or High School students. From learning computer coding to 3D printing, these workshops give unique and specific opportunities to get hands-on with science, technology, engineering, art, and math. Beginning at age 14, high schoolers have the opportunity to volunteer at the Ann Arbor Hands-On Museum. Volunteers work side by side AAHOM staff in a variety of roles, providing extraordinary educational experiences, exceptional customer service, and exciting behind-the-scenes support that helps to make the Ann Arbor Hands-On Museum one of Ann Arbor’s most popular family attractions. We have many unique exhibits that appeal to all ages. Check out the video below!